From reception to dental hygienist to doctor, my experience was wonderful. Very polite and supporting. No complaints! Awesome first visit and looking forward to going back! I am a new customer to the dental practice but am very pleased with the level of care that I have a received so far. My hygienist, Stephanie, was very thorough (and gentile) during the cleaning/exam and went above and beyond to assist me with my insurance coverage. 5/5 would recommend to anyone in search of a new dentist! I have been going to this practice close to 20 years. There was a different doctor before however even the new team is great. No complains over any of their treatments or recommendations. 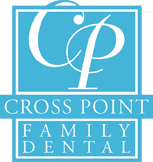 Whether you have been a patient in our office or looking for a new dental practice to serve your needs, Crosspoint Family Dental offers a unique approach to dentistry. Our comprehensive spectrum of services delivered in a friendly, comfortable atmosphere is the foundation of our practice. We offer a full range of cosmetic, restorative and general dental service with an emphasis on prevention.